Gov. 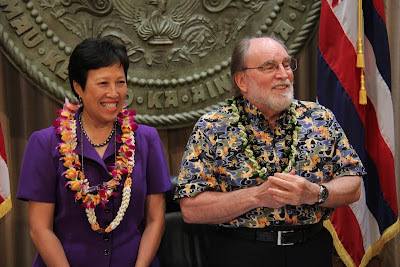 Neil Abercrombie signed legislation Thursday that ends junior kindergarten in 2014, and establishes a state Office of Early Learning to begin phasing in a publicly funded preschool network. Terry Lock, who has been serving as the state's first early childhood coordinator, was appointed by the governor to head the early learning office. Star-Advertiser. Hawaii bet correctly that the Supreme Court would uphold the bulk of President Barack Obama’s health care overhaul, but the state plans a full analysis to see how the lengthy ruling affects plans to implement the law. Associated Press. In the home state of President Barack Obama, government officials and healthcare executives were all smiles Thursday over the U.S. Supreme Court decision favoring Obama’s national health insurance initiative. Hawaii Reporter. Hawaii government and health care industry leaders applauded Thursday's U.S. Supreme Court decision upholding President Barack Obama's historic health care reform act and pledged to work across agencies to tie in and blend the federal standards with Hawaii's own landmark legislation. Star-Advertiser. Hawaii’s top government officials celebrated Thursday as word came down that the U.S. Supreme Court had upheld the major tenants of President Barack Obama’s health-care reform legislation. Civil Beat. Not long after the U.S. Supreme Court upheld the Affordable Care Act on Thursday, the members of Hawaii's congressional delegation — all Democrats — were in unison in welcoming the surprise decision. Civil Beat. Hawaii insurers have said they have been implementing the law's provisions as required and that the Supreme Court's ruling was unlikely to change anything. Pacific Business News. Health insurance is a necessity for all, but mandates that citizens buy insurance or pay a penalty may be cause for concern, Big Island residents and visitors said Thursday. West Hawaii Today. Regardless of what the Supreme Court decided, public opinion is split on Obamacare. Tribune-Herald. Affordable Care Act's effects on Hawaii. Hawaii News Now. There was a round of applause by state leaders Thursday after the Supreme Court's ruling to uphold the President's Health Care Law. KHON2. The world's largest international maritime training exercise starts Friday in Hawaii. Hawaii News Now. State roundup for June 29. Associated Press. With just over a month left until the primary election, Honolulu mayoral candidates and PACs — including two newcomers — are ramping up their TV ad spending. Civil Beat. A change in city bus routes is leading some riders to switch to driving their cars and overloading buses on some routes to the point where they have to bypass people at bus stops. Star-Advertiser. Honolulu Rail Transit officials marked a major milestone today in their effort to secure 1.55 billion dollars in federal funding for the city’s largest public works project, ever. Hawaii Public Radio. Thursday, the Honolulu Authority for Rapid Transportation (HART) submitted an application to the Federal Transit Administration for a full funding grant agreement, the first step in securing up to $1.55 billion in federal subsidies for the city's controversial rail project. KITV4. The city of Honolulu Thursday released details of its formal application for $1.55 billion in federal funding for the Honolulu rail line, the submittal of which rail advocates described as one of the most significant milestones yet for the controversial project. Star-Advertiser. A seemingly innocuous statement by one of the leading candidates for Honolulu mayor has reignited a blaze of accusations and concerns about a potential merger of the city's Fire and Emergency Services departments. Civil Beat. Three different groups gathered in Kunia to protest Monsanto. KHON2. Hawaii Island has more than 500 foreclosures pending in the 3rd Circuit Court, appraisers say. Compare that figure with the 1,289 active real estate listings the county has, appraiser Larry Baird said. West Hawaii Today. New claims for unemployment compensation on the Big Island dropped last week, while total claims, including repeat filers, remained low. West Hawaii Today. 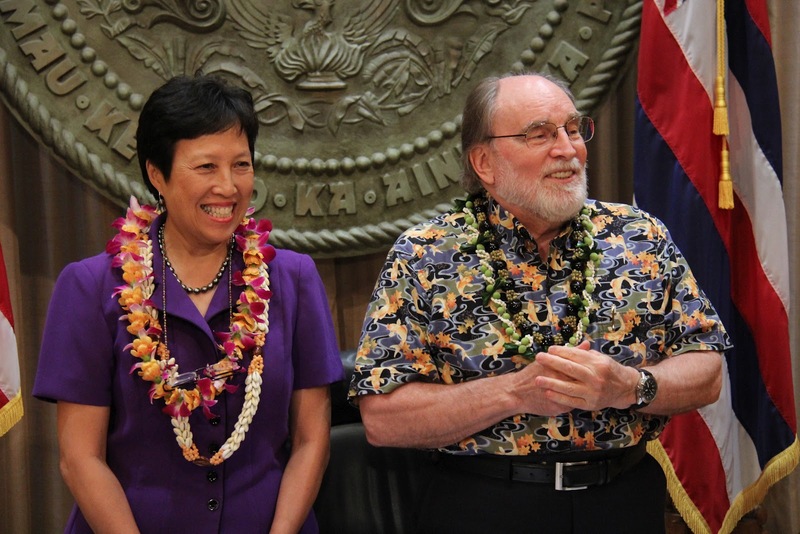 A “Permitting Open House” will be held on July 6 by Mayor Alan Arakawa’s Permit Process Improvement Team (PPIT) taskforce and the public is encouraged to attend this free event. Maui Now. Last Fourth of July, the Maui County Fire Department responded to 73 fireworks-related calls - about the average number for the past three years. Maui News. A cross-cultural event recently celebrated the return of traditional food sourcing and preparation in the interest of health and heritage. Garden Island. Voters will not decide in the November elections what “shall” really means when it’s spelled out in the Kaua‘i County Charter. Garden Island. The third-richest man in America, Oracle Corp. co-founder and CEO Larry Ellison, has completed his acquisition of Lanai, seller Castle & Cooke Inc. said Thursday. Star-Advertiser. The sale of most of Lanai and its assets to billionaire Larry Ellison was successfully completed, seller Castle & Cooke Inc. announced Thursday morning. Maui News. Castle & Cooke announced today the completion of sale of its Lāna‘i assets by David Murdock to Lawrence J. Ellison to Oracle CEO Larry Ellison. Maui Now.